Story #4: "A Forgotten TMNT Adventure"
Any chance of you continuing the reviews on the Archie TMNT comics? I just discovered your reviews and rather enjoy reading them. In case you already posted an article in which you explained why you have postponed your reviews, or have stopped with them, sorry for this comment as I didn't see it. (I can understand why it is sometimes a task of writing them as some of the preaching in the stories is damn annoying to the level of unbearable . Sorry to make it appear like I've quit on the Archie series for any reason. I just got sidetracked reviewing Mirage books to the point that they were all I could think about! I'll get back to the Archie series right away and try and balance out which publishers I review from now on. I've been determining that for myself as I've been going along through the series. Eventually, once I've read and reviewed everything, I'll make a chronology similar to my Mirage Continuity Timeline. And that's as far as I've gotten so far. thank you so much now i have somthing to go on and good luck with your archie tmnt timeline and thanks again. just to let you know i might have somthing that can help you. You know the year of the turtle it goes last in the time line. Because in the comic book a man sits on the bed next to a child that wants to hear more storys and the man says ok but this is the last one and then you have hurd them all. So that is what makes me think it goes last i thoght that might help GOOD LUCK!!! I haven't gotten that far in my reviews yet, but it'd have to go somewhere between TMNTA #45 and #51. Likewise with the Merdude miniseries. Do you know by any chance where i can download the tmnt archie specials, and mighty mutanimals comics ? 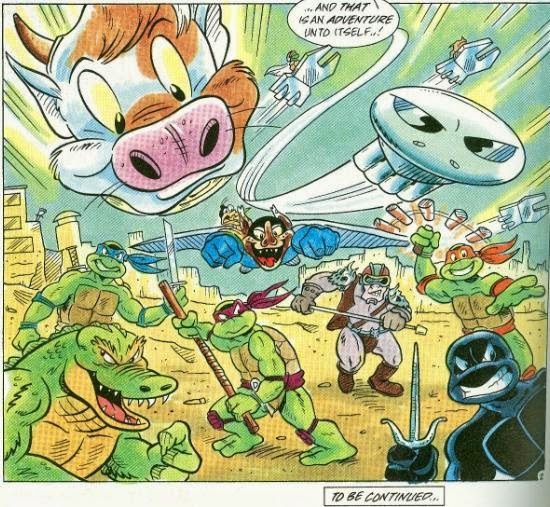 hey do you know where the tmnt meet the last of the viking heroes fits in to the timeline. Becuse i checked the marage time line and could not find them. Are they in the archie tmnt time line? I was curious. Are you going to put in the TMNT Magazine Mini-comics in the timeline? I just wanted to post an interesting factoid about the Slash trilogy(TMNT adventures #s 23 (search and destroy), 24 (Gimme Danger), and 25 (Raw Power)). All of the issue names are songs that were composed by the god-father of punk rock Iggy Pop. Cool issue titles for a cool story arc. I suggest checking out both the comics and the songs for anyone who hasn't.